A dental crown is a versatile treatment procedure that helps to strengthen teeth when they become weakened due to decay or injury. They also prevent further damage from happening to the tooth. 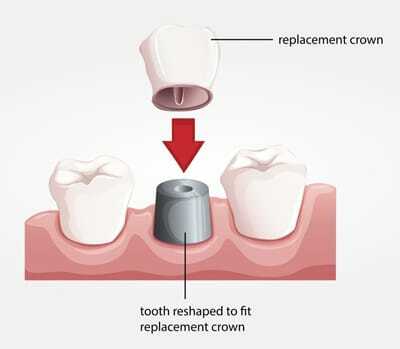 Crowns are sometimes called caps as they are placed over the top of natural teeth, being designed to strengthen the visible part of the tooth. Dental crowns are available in wide range of dental materials, including ceramic, precious metals and porcelain fused to metal. Modern crowns are strong, durable and aesthetically pleasing, with most people preferring to choose all-ceramic dental crowns as they look more like natural teeth. Alternatively, we may also recommend treatment using cusp capping, whereby composite fillings to replace the cusps in teeth. Fitting a porcelain crown involves two stages. 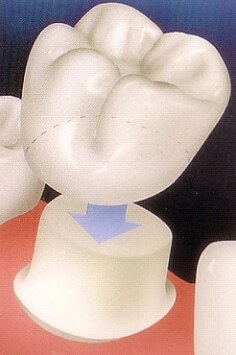 The first stage is designed to remove any decayed or damaged tissue and prepare the tooth for crowning. The decayed tissue is removed and the tooth is cleaned thoroughly and shaped. A dental impression is then created and this is sent away to the laboratory as a template for the new crown. The crown is then fitted upon its fabrication and shaped for best smile aesthetics. Crowns last many many years of service provided they are cared for. We also provide treatment that includes full crowns, veneered and indirect restoration.